I've known for some years that my great-grandfather, Walter Ellis, as well as being an Edge Tool Grinder, ran a pub called the Dolphin on Edward Street in Netherthorpe area. I’ve seen a mention of the pub in a book, but can’t remember the name of the book and wondered if anyone had any other background information or knows the slim volume I refer to? Sadly, Walter died tragically after being run over by a tram in Winster Road, Owlerton. As I’ve only been researching my family tree for 3 weeks, I’ve yet to investigate archive materials of this. If anyone knows of any reports of this I’d really appreciate any pointers in the right direction. The Ellis family lived in several houses on Summer Street from the late 1800’s. 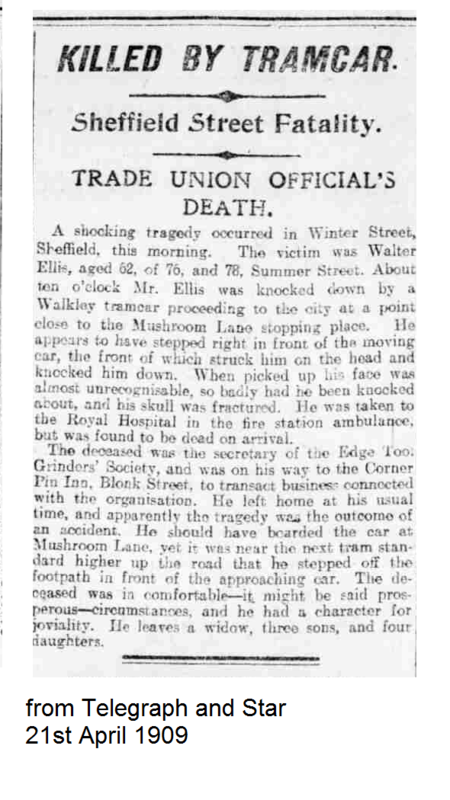 Walter was a friend of William Broadhead and used to drink with him in the Red House on Solly Street. I've known for some years that my great-grandfather, Walter Ellis, as well as being an Edge Tool Grinder, ran a pub called the Dolphin﻿ on Edward Street﻿ in Netherthorpe area. Thanks so much for these clippings. It brings his character to life and confirms some of the few details we as a family know about him. My father wasn’t born until 1928 so didn’t know him at all and lost his own father in 1944. The Ellis family occupied a good number of houses on Summer Street, so no doubt running a beer house on the street was a popular idea, As you will no doubt know, the more information we have, the more we want to know. Thanks again for this post. I really appreciate it. 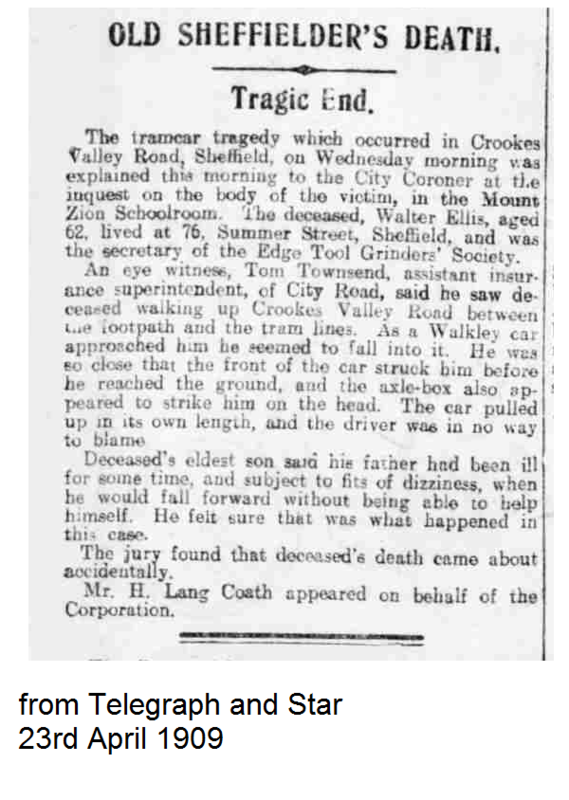 I'm very new to this kind of research and am trying to piece the scant information I have to try to understand my family's life on Summmer Street before they scattered to the hills of Sheffield and beyond. I think it is more likely that the Dolphin was the beerhouse on Summer Street. My Dad used to tell me tales of his aunts and uncles helping themselves to drinks on the cellar steps. They seemed a lively bunch. Great Grandad Walter is described as a jovial character, a trait that has passed down through the generations. Thanks for your help with this. The Ellis Family, circa 1903. The photograph was taken because the last of the Elliott family sisters was leaving Sheffield for Philadelphia. I know there are a number of copies of this picture in circulation and hope to find the owner of the original version at some point. The licence for the Dolphin beerhouse, Summer street changed hands in 1915 (see 2/3 of way down on the attached) Charles Brearley to Arthur Ellis. Thanks again Edmund for your input. However, I wonder if this went to one of my great uncles as my grandfather died in 1909? I think I need to find a book on drinking habits and places of the time. Could you recommend anything? Wow! Again, many thanks. This is perfect. From this I can track the different houses where the family lived over the years. My presumption is that by the 1950's there was little point in referring to a single premises as "76 and 78" as it was by then unlikely that they would be separated into two again. Dolphin beerhouse changing hands. But I do not know if it is him. 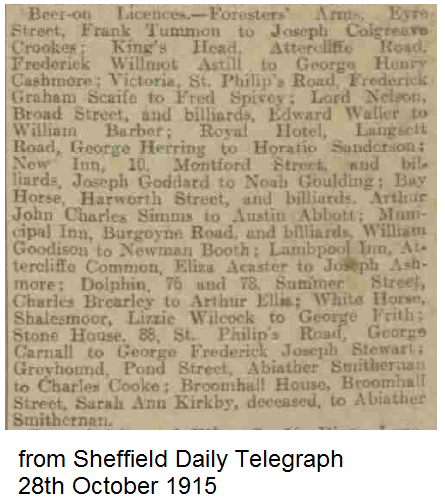 I also have a Walter Ellis born in Sheffield May 12 1876. but he is much younger than your Walter. 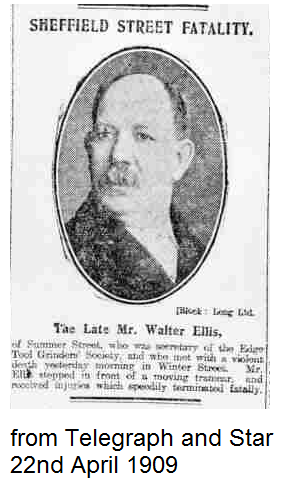 I also have a Walter Ellis in my family tree. He was married to Harriot Elliot. They had a son (and maybe more children, but I don't have details) called Francis George Pearce Walter Ellis who married Mary Ellen Moore. Their ages were respectively 22 and 19, and the marriage was on 14th April 1903. 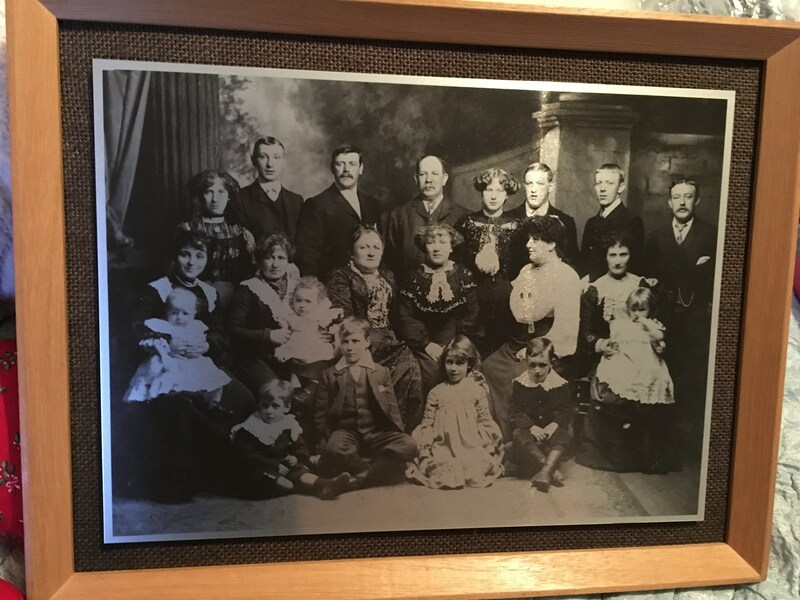 FGPWE (what Mary used to call him when she was annoyed with him so I'm told) is on the back row of the picture, 3rd from the right. 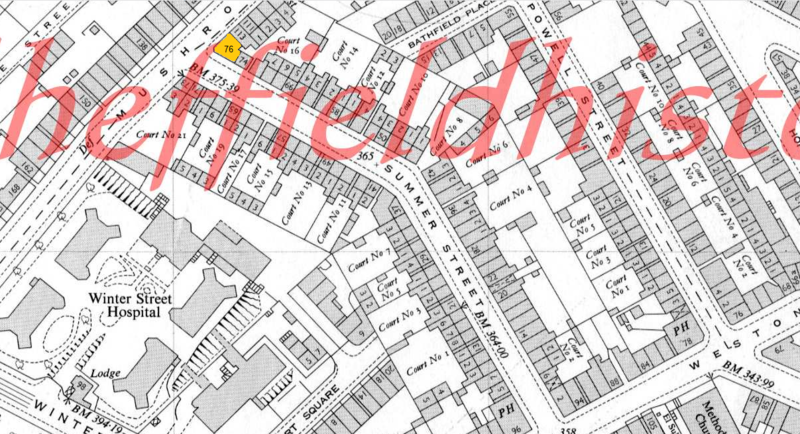 FGPWE, who was a grinder, of 64 Summer Street, died aged 63 and was buried at Crookes on 2 Dec 1944. Mary Ellen died aged 65 and was buried on 26th August 1948.
i believe we are cousins. I met Aunty Norah only once when I was a child. I was with my Dad, her youngest brother Leslie, in the old Rag and Tag market. They rarely saw each other but I remember how happy they both were to bump into each other. I’m currently researching the Ellis family history which is full of characters! Frank and Mary Ellen had 13 children in total, starting in 1903 with my Uncle Ray. There were 8 boys and 5 girls. Two of the girls and one boy died in childhood. They ,mostly lived on Summer Street. I look like my grandmother or at least I did at a similar age and also like my Aunty Mary. Depending on the year , I may have been there in the Rag and Tag. it was the Saturday morning outing, me and my Mum and Norah going to the markets and Woolworths, seeing "potty" Edwards throwing dinner services around, and the big weighing machine. I didn't know they had so many children. My dad, Norah's son, (still with us, aged 91) remembers uncle Les. I've got an old wedding photo with Frank, his son Frank, and Thomas along with his bride (don't know her name), Nancy, Mary Eĺlen and presumably the bride's parents. I'll copy it and send it via a message on here if you like. Also pics of Norah. If Frank was your grandfather, and my great grandfather, I think that makes us first cousins once removed? I got what knowledge I have of the Ellis family on a free weekend on Ancestry but never followed it up. Perhaps I should do it now. I've also sent a private message. I used to love the Rag and Tag especially the weighing machine and Pot man. I think it would have been in the late 60’s or early 70's. I seem to remember Dad saying Norah was around 66 which seemed so old at the time, but not so much now I’m older! I guess that makes it around 1971. I don’t work on Fridays so will start searching out other photos to share. 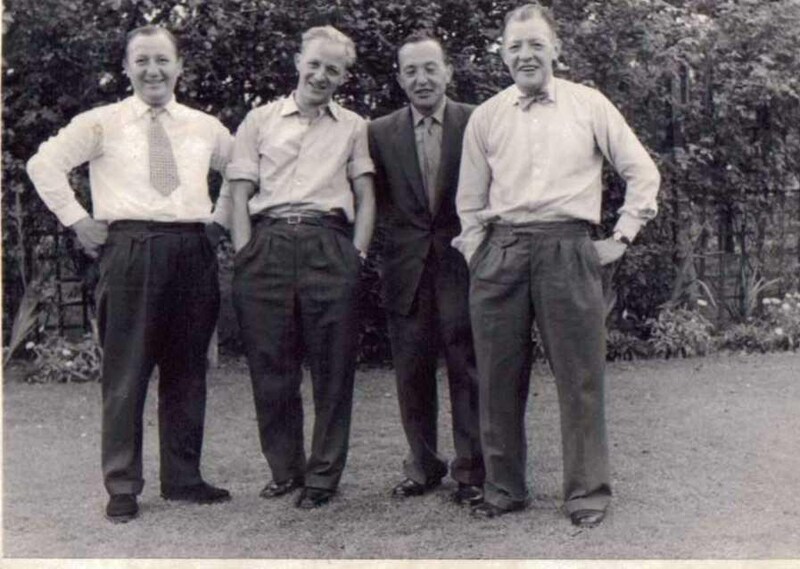 I have a great one of four of the brothers - Walter, Frank, Albert and my dad, Leslie. Ive been looking at Arthur Ellis in my tree, born in 1888 and the connection to the Dolphin. i have no evidence of this as yet, but I think Walter Ellis and his wife Harriet, would have known Charley Brearley who was a local grocer. I think he might have taken on the Dolphin after Walter died and 5 years later it passed to cousin Arthur. He went on to become a wines and spirits merchant and lived to 1963 in the SW of the city.